On Inauguration Day, First Lady Melania Trump wore a custom-made Ralph Lauren baby blue double-faced cashmere jacket and dress with matching baby blue pumps (Source: Footwear News / Image: REX Shutterstock). Designers Marc Jacobs and Tom Ford refused to outfit Melania Trump. 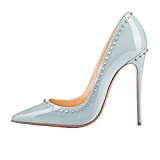 You can find Baby Blue Pumps for the best price on Amazon. Ralph Lauren also designed several of Hillary Clinton’s pantsuits. And now Ralph Lauren is receiving backlash for dressing Melania Trump. Just search the hashtag #BoycottRalphLauren. Jackie Kennedy wore a similar outfit for her husband, John F. Kennedy’s Inauguration Day back in 1961. Was Melania Trump channeling the late Jackie Kennedy-Onassis? Or maybe Melania Trump is a closet Harry Potter fan wishing she was at Beauxbatons school? The memes going around about Melania Trump are just too funny not to share.